Good news Pokémon fans! Starting 4th March, the mythical Pokémon Meloetta will be distributed by participating GameStop stores across North America for Pokémon Black & White and Pokémon Black & White 2, for a limited time only. 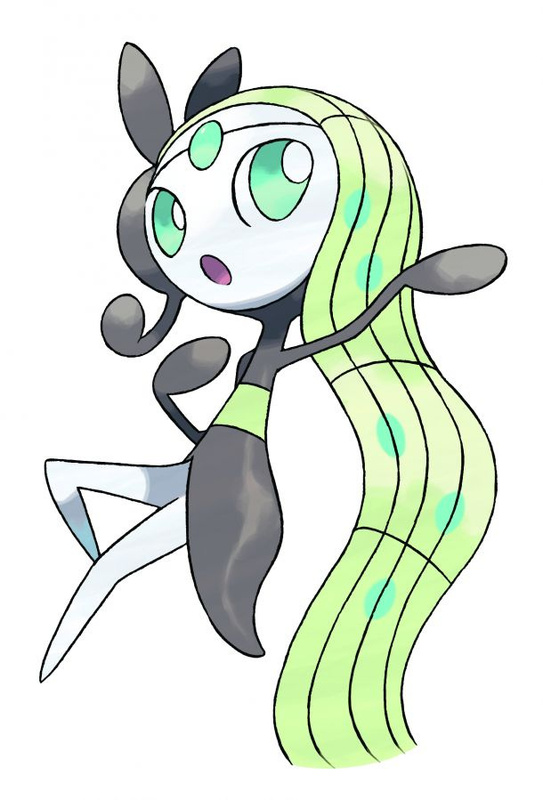 Meloetta is the very first Pokémon able to change its Forme and type during a battle, using a particular move to trigger the change; its Pirouette Forme is the only Pokémon with a Normal- and Fighting-type combination. It fights as a Normal - and Psychic-type in it's Aria Forme. Players in Canada will also get in on the event at participating EB Games shops starting 9th March. For those interested in picking up the mythical monster, make sure you have no more than 11 Wonder Cards in your possession, otherwise you won't be able to catch the beast. Not forgetting your copy of the game would be useful too. Will you be hoping to add Meloetta to your party? As always, let us know. I wanna nickname mine Gumi. hopefully i can get it too.....i didn't get the last gamestop distribution because I feel like an idiot at 30 going into gamestop for a pokemon. I wish this was just a wi-fi event instead. Nah,i'm not driving to Gamestop just for a Pokemon. @Pogocoop after the Vocaloid Gumi? I was gunna name mine Meiko for it's Pirouette Form haha! I would but I traded in my copies of Pokemon Black and White since I never played them. Not even sure why I bought them in the first place. Finally. I've been waiting for this one. Why use a Meloetta when I can just use Heatran, Scizor, Genesect, Ferrothorn, Dragonite, Manoswine, or Breloom? Thanks, but no thanks. I'll just own people with my eventual team when I pick up my White 2. Oh great. Another event pokemon I will never get. "It can be yours" Oh you will be mine baby. @mumof2kids82- Bah, don't feel embarrassed! Plenty of us adults go to Gamestop for our pokémon. I'll be there, after all! I'm only 20 pokemon away from (legitimately, no hacking/action replay) having a complete pokedex. Meloetta is one of those pokemon and I don't plan on trading one over the GTS for a "Lvl 9 or under Reshiram"! ... all i can say is ... its about time! cant wait to get mine! Got to make sure I don't miss out on this one! Marking the calendar this time. Hopefully she becomes available through wifi later. Keldeo was like that - an in-game event first, then a wifi event. As an Aussie I'd like to be able to catch her! I go to the Gamestop in the mall to download these. Most times I can just stand right outside the store as I do it. Yeah for those not wanting to actually go in the store, generally you can be outside the store and be in range for the event. I've sat in a gamestop parking lot in my car and gotten a pokemon before. So, not for Europe then? I would really like this little cutie, I hope there will be a chance for Europe too. I hate it that not everyone can get the special Pokémon. Finally! Can't wait to get two! Not a wi-fi event? Pass. It's great that it's open to both BW and BW2. Sweet! I can get two of them. @mumof2kids82 You shouldn't be embarrassed, but if you are, you don't even need to go into the store to get it necessarily. I've pulled up and downloaded mine even after closing time. It's ABOUT TIME this event is happening!! I find it strange that we got Genesect before Meloetta. "Weird...."
I would like to train it, but I'm pretty sure it's not allowed for Battle Subway or Pokemon World Tournament in Black2/White2...so I'll just get it for Pokedex. Yea. Guess I need to make my way down to Gamestop again. I wonder if it would be cutting it too close if I were to go for it the day I get Luigi's Mansion: Dark Moon, which is the last day listed. Yay finally! I'm glad they weren't jerks and both versions of the game can get it. It also means if you kept both you can get 2! Sweet! And yes you can just park/sit outside your local GameStop to get this Pokemon. I've done it for everyone they've put out that I managed to remember to get. If you got one in a mall just make it part of the trip if you are going shopping or to see a movie. Just stand nearby and take care of business. @mumof2kids82 hahahahahaha, I`m 21 and i just start it playing pokemon again since 1999, i had to buy pokemon black online because i was to emberrased to walk in walmart or gamestop to ask, YES i want that pokemon game please. I know how you feel! xD. When i bought Pokemon Soul Silver i had my girlfriend pretend she was buying it for herself as i stood 30 feet away pretending to watch the HD tvs! And nintendo needs to realize people over the age of 18 still play pokemon and just make all these events wifi events. Now i have to bother my little nephew to go in gamestop and download the pokemon for me. damn!